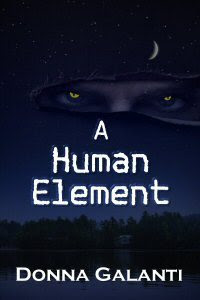 I was drawn to the synopsis of A Human Element by Donna Galanti and it's promise of a girl with healing powers and a serial killer who haunts her dreams. Galanti delivered a dark, gritty tale with a science-fiction twist that was both fascinating and disturbing. Three word review: dark, suspenseful and hopeful. The tale begins with a tragic event caused by a meteorite. We then follow the lives of two strangers; Laura Armstrong an adopted woman with the power to heal who is surrounded in tragedy and Ben Fieldstone an orphaned man who strayed and then pulls himself back together. Both are plagued by dreams/nightmares and seek closure and understanding from events in their past. He returns to the summer town where he and his parents vacationed and Lauren returns to her hometown after another tragic event has her reeling. The tale that unfolds was dark, violent, tender and suspenseful as together they must face a mad killer. Laura is such a unique and refreshing character. She is naïve at times and eternally optimistic despite the cards fate has dealt her. She knows she is different and guards her secret. Plagued by tragedy she still manages to see the beauty in a sunrise. Ben is plagued by guilt, and tormented by events from his past. He was lost, and now lives as a nomad. With the exception of one close friend he keeps the world at a distance. They both have dreamed about the other and when they meet there is an instant connection. This had a little insta-love feel but the set up allowed me to accept it. A stranger has appeared throughout both of their lives and he fascinated me. I liked how the author kept his intentions shadowed. The killer's thoughts are shared with us. His upbringing has made him dark, sinister and blood thirsty. He has unimaginable power and feels such pain. Mr. B an old hermit living on the mountainside was a lovable figure and I enjoyed his interactions with Laura and eventually Ben. Other characters help guide the duo and steer the tale. Galanti’s tale is a unique one and was well paced. It is very dark and violent at times, even uncomfortable for the reader as she gives us a detailed account of the violence as it unfolds. Some of the subject matter is taboo and added to the suspenseful and sinister feel of the tales darker moments. I squirmed as I read some scenes and was both disturbed and disgusted by the evil perpetrated. Galanti also gives us light, love and hope within the pages that helped offset the dark and allowed me to catch my breath. There is a violent climactic scene and then the author makes us privy to hope, rebirth and a unique chance. I really liked the ending and loved how she took this book from such horrible darkness to brilliant light. Fans of dark science-fiction, suspense and romance will enjoy A Human Element and it's unique paranormal tale. While at times disturbing the author held my attention and gave me one heck of a ride. Awww, thanks Kim! Again, really appreciate the read and thoughtful review. This was different and dark. The mystery was fascinating. Hope you get a chance to read it! One heck of a ride is huge recommendation to me. Love the cover, creepy and beautiful. Not sure I would enjoy the darkness of this one but it sounds good. Well-written review, Kimba -- you're good at intriguing me even when I think the book isn't for me. While it had some dark moments that made me shiver, I loved the suspense and learning about the characters before they came together. Thanks Sharon! This one sounds intense and the evil really creepy I'm not sure it would be for me but I am curious. thanks Dani, I loved figuring out what was going on and seeing what happened. The dark sci-fi element is putting me off! Lovely review though Kimba, just not my cup of tea! *waves* have a great weekend Blodeuedd! ooh I am them same way..no blood, gore, monster psycho movies for me... but I love to read them! I love dark and gritty, and crime and gore..but not movies only books and not a steady diet either! this is a soft sci-fi with heavy elements of suspense/thriller and a twist of paranormal! hehehe...me too even if I squirm! her powers were done well Brandi! Ha...next week is cray-cray on the blog Nick..I have urban fantasy, historical fiction, woman's fiction , chick-lit, paranormal and new adult contemporaries .so you never know what you will find! I like both Laura and Ben very much! I am with Melissa, I am a wimp these days, even though I didn't use to be, having kids made me soft. I can only handle too much dark and if you squirmed I don't know if I could do this one. Thanks for the honest review! What is funny is that I'm such a wimp when it comes to these kind of things in movies and whatnot. However, in books I "think" I can handle it. At least I have so far. LOL I do think this is one I'd like to try. It sounds very good! It's a little hard for me to read dark books, and I'm glad you enjoyed this one despite that. Thanks for the very informative review! This sounds interesting! I'm normally not into the sci fi element but I could make an exception! I really like this cover too!!! Aww, I'm kind of sad that I'm not seeing an adult contemporary romance review today! But that's okay! I'm reading Crave by Monica Murphy atm and I was thinking how you would enjoy that one. Anyways, this sounds like a really dark book. I love that some scenes made you squirm because of the evil. I guess this shouldn't be a book I read by myself at night. Laura and Ben both sound like they have so much going on for them. I'm glad at the end things don't end in darkness! I like the premise too, the healing powers can be interesting if done right! Sounds like a pretty intense and dark story, I like those kinds of reads. Great review. Thanks so much for reading and reviewing A HUMAN ELEMENT! I so enjoyed your in depth review. I am passing off the sequel to my publisher this month! Readers can also get more taste of characters in both books with my short story collection, THE DARK INSIDE, on Kindle only. Oh this sounds like a good one too! Gosh you have all these great reads lately that I want to try! So many books and only 24 hours in the day!